MEXICO CITY – The current era of innovation, in which cutting-edge technologies are disrupting entire economic sectors at a breathtaking rate, has been called the Fourth Industrial Revolution. It is also the theme of the World Economic Forum’s annual meeting this week in Davos, Switzerland – and rightly so. In the coming years, the scope and pace of innovation will transform how we produce, distribute, and consume. To maximize the benefits, we must take steps now to prepare our economies and societies, with a focus on three key areas: education, the business environment, and connectivity. Human capital is vital to an economy’s success, and Mexico is no exception. That is why my government is focusing so heavily on improving education at all levels. For example, we recently launched “Education Infrastructure Notes,” private investment vehicles that will allow us to channel roughly $3 billion to improve elementary-school facilities within the next three years. In addition, during the current school year, we have delivered tablet computers to almost half of Mexico’s 2.3 million fifth-graders. We are also working to ensure that current and future generations gain the skills they will need to thrive in an evolving labor market. Last year, more than 110,000 students in Mexico earned degrees in areas such as engineering, manufacturing, and construction – a higher figure than in some of the most developed countries, including France, Germany, and the United Kingdom. To reinforce this progress, we are also increasing public investment in science and technology at universities and public research centers throughout the country. In the last three years alone, the number of scholars in our National Researchers System has increased by 26%, and we have almost doubled public expenditure on research, development, and innovation. Recognizing the vital importance of the linkages among government, industry, and academia, we have also increased the number of technology-transfer offices to support the development of new products and businesses in areas such as biotechnology, energy, and information technologies. At the same time, we are working tirelessly to improve the business and investment environment. For starters, we have made major strides toward macroeconomic stability. Our central bank has established an independent monetary policy that ensures price stability and low inflation; in fact, in November, the annual inflation rate, at 2.21%, was the lowest in Mexico’s history. And our debt remains low and diversified. The debt-to-GDP ratio for 2015 is expected to stand at 46.9% – well below the Latin American average of 55.6% – and should stabilize at 47.8% in the coming year. We have also pursued energy reform, which has lowered electricity costs, eliminated monthly increases in gasoline prices, and expanded gas pipelines throughout the country, thereby boosting competitiveness. For the first time in decades, all energy-sector activities are open to private capital – a strategy that will attract an estimated $12.6 billion in investment every year. Similarly, enabling foreign investment in the telecommunications sector has lowered prices for landline and cellular services, while improving quality and coverage. Given that micro, small, and medium-size enterprises are the main drivers of Mexico’s economy, we are using digital tools to make it quicker and easier for entrepreneurs to start their own businesses, while facilitating their access to commercial bank funding. Our Young Credit Program gives entrepreneurs a loan of up to $9,000; for those seeking to consolidate an ongoing business, the total may be as much as $150,000. The third key step to prepare our economy for the Fourth Industrial Revolution is connectivity. Mexico is one of the few countries that formally recognize the right of its people to a broadband Internet connection. So far, we have established 65,000 public places, such as schools, libraries, and squares, with broadband connections. This will help us to reach our goal of providing high-speed Internet service to 70% of households and 85% of micro, small, and medium-size businesses. But connectivity is not only digital; physical infrastructure is also vital. Already, Mexico is a manufacturing powerhouse and one of the world’s top sellers of goods like television sets, vehicles, auto parts, computers, and mobile phones. Improved infrastructure would enable us to boost the value and variety of our export-oriented industries. That is why we are channeling more than $460 billion toward building and modernizing thousands of kilometers of roads and highways, as well as expanding and improving our mass transit and railway systems. Other large-scale infrastructure projects include a new international airport in Mexico City and seaport development that will almost double existing capacity on the Pacific Ocean and the Gulf of Mexico. In the long run, we will make Mexico a world-class logistics platform. Finally, Mexico is committed to continue boosting foreign trade, a powerful growth engine. Over the last three years, we have expanded our network of free-trade agreements to include the Pacific Alliance and, more recently, the Trans-Pacific Partnership. That will make a total of 13 free-trade agreements, providing preferential access to 52 countries with 1.3 billion potential consumers. Our government has already made critical decisions to prepare Mexico’s economy for what lies ahead – and is backing them up with concrete action. We must build on this progress to address outstanding challenges, including rising demand for a wide range of specialized knowledge professionals and an urgent need to improve connectivity, especially in remote rural areas (where 9% of Mexico’s population lives). We must give our citizens and businesses the tools they need to take advantage of the opportunities that the Fourth Industrial Revolution creates, and ensure that future generations, too, can reach their full potential in a rapidly changing world. As we've been warning for quite a while (too long for my taste): the world's grand experiment with debt has come to an end. And it's now unraveling. Sadly, we think so. While there may be a market rescue that provide some relief in the near term, looking at the next few years, we will experience this as a time of unprecedented financial market turmoil, political upheaval and social unrest. The losses will be staggering. Markets are going to crash, wealth will be transferred from the unwary to the well-connected, and life for most people will get harder as measured against the recent past. It's nothing personal; it's just math. This is simply the way things go when a prolonged series of very bad decisions have been made. Not by you or me, mind you. Most of the bad decisions that will haunt our future were made by the Federal Reserve in its ridiculous attempts to sustain the unsustainable. Yes, it's easy to pick on the Fed now that it's obvious that they've failed to bring prosperity to anyone but their inside coterie of rich friends and big client banks. But I've been pointing out the Fed's grotesque failures for a very long time. Again, too long for my tastes. 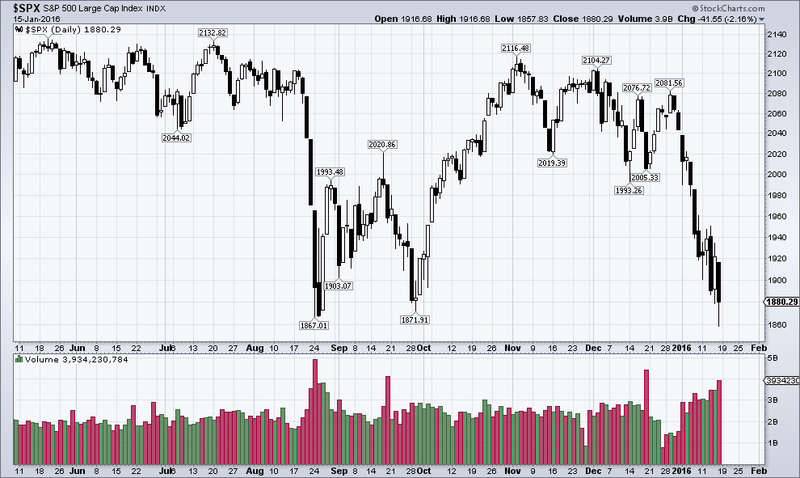 Note the pattern in the above monthly chart of the S&P 500. A relatively minor market slump in 1994 was treated by the then Greenspan Fed with an astonishing burst of new money creation -- via its 'sweeps' program response, which effectively eliminated reserve requirements for banks .That misguided policy created the first so-called Tech Bubble, which burst in 2000. The next move by the Fed was to drop rates to 1%, which gave us the Housing Bubble. That was a much worse and more destructive event than the bubble that preceded it. And it burst in 2008. Then the Fed (under Bernanke this time) dropped rates to 0%. The rest of the world's central banks followed in lockstep (some going even further, into negative territory, as in Europe's case). This has led to a gigantic, interconnected set of bubbles across equities, bonds and real estate -- virtually everywhere across the globe. So the Fed's pattern here was: fixing a small problem with a bad decision, which lead to an even larger problem addressed by an even worse decision, resulting in an even larger set of problems that are now in the process of deflating/bursting. Three sets of increasingly bad decisions in a row. The amplitude and frequency of the bubbles and crashes are both increasing. As is the size and scope of the destruction. The even larger backdrop to all of this is that the developed world, and recently China, have been stoking growth with debt, and have been doing so for a very long time. As practically everybody can quickly work out, increasing your debts at 2x the rate of your income eventually puts you in the poor house. As I said, it's nothing personal; it's just math. But somehow, this math escaped the Fed's researchers and policy makers as a problem. Well, turns out it is. And it's now knocking loudly on the world's door. The deflation monster has arrived. The only possible way to rationalize such an increase in debt is to convince oneself that economic growth will come roaring back, and make it all okay. But the world is now ten years into an era of structurally weak GDP and there are no signs that high growth is coming back any time soon, if ever. So the entire edifice of debt-funded growth is now being called into question -- at least by those who are paying attention or who aren't hopelessly blinkered by a belief system rooted in the high net energy growth paradigms of the past. At any rate, I started the chart in 1970 because it was in 1971 that the US broke the dollar's linkage to gold. The rest of the world complained for a bit at the time, but politicians everywhere quickly realized that the loss of the golden tether also allowed them to spend with wild abandon and rack up huge deficits. So it was wildly popular. The above charts show how hopelessly entangled the worldwide web of debt has become. Yes, it's all made possible by the delusion that somehow being owed money by an insolvent entity will endlessly prevent your own insolvency from being revealed. How much longer can that delusion last? All of this is really just the terminal sign of a major credit bubble -- a credit era, if you will -- drawing to a close. Well, the central banks of the world could not bring themselves to voluntarily end the credit expansion - that would have taken real courage. So now we are facing something far worse. I'm not just calling for another run of the mill bear market for equities, but for the unwinding of the largest and most ill-conceived credit bubble in all of history. Equities are a side story to a larger one. It's global and it's huge. This deflationary monster has no equal in all of history, so there's not a lot of history to guide us here. At Peak Prosperity we favor the model that predicts 'first the deflation, then the inflation' or the "Ka-Poom! Theory" as Erik Janszen at iTulip described it. While it may seem that we are many years away from runaway inflation (and some are doubting it will or ever could arrive again), here's how that will probably unfold. Given that their efforts have not yielded the desired or necessary results, what can they realistically do that they haven't already? Either way, money will be printed out of thin air and given to you. That's what's coming next. Possibly after a failed attempt at demanding negative interest rates from the banks. But coming it is. This "helicopter money" spree will juice the system one last time, stoking the flames of inflation. And while the central banks assume they can control what happens next, I think they cannot. 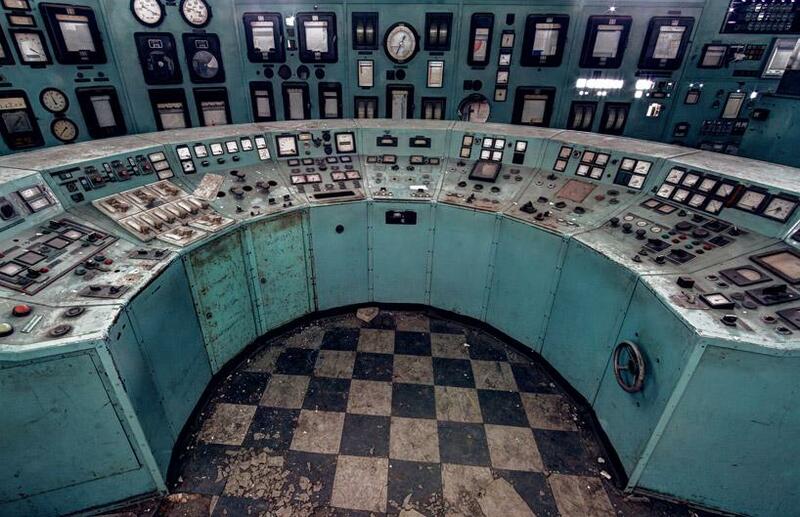 Forget the techno-babble. Detroit needs to engage in straight talk about regulation. General Motors Co. GM -0.76 % last week disclosed its $500 million investment in the ride-sharing startup Lyft, and the announcement was a gem of obfuscatory PR that could only have been cooked up by GM itself. The two companies, it said, were joining up to create a “network” of driverless, ride-sharing robot vehicles. Let’s see: Ride-sharing is largely an urban phenomenon, but congested urban settings will not soon be hospitable to robot cars. Autonomous vehicles will be practical sooner in exurban environments, particularly on the freeway, but these environments don’t fit the ride-sharing business model. In short, GM and Lyft are selling vaporware for the more gullible sort of tech geek. Don’t fight the meme! And the meme today is all about electric cars, self-driving cars, ride-sharing. But GM’s puffery is also typical of an industry deeply habituated to public disingenuousness as part of its strategy to survive the relentless onslaught of politicians and their regulations. Electric cars’ enlistment in the climate wars makes little sense either: Two-thirds of America’s electricity is produced by burning fossil fuels, and U.S. passenger cars account for less than 2% of global emissions anyway. Converting them to electricity solves nothing. Detroit as an industry has long put up with unusually close public and political attention and has developed PR habits that amount to a comprehensive smokescreen around its decision making and internal motives. That especially means not talking about what’s really on its mind. 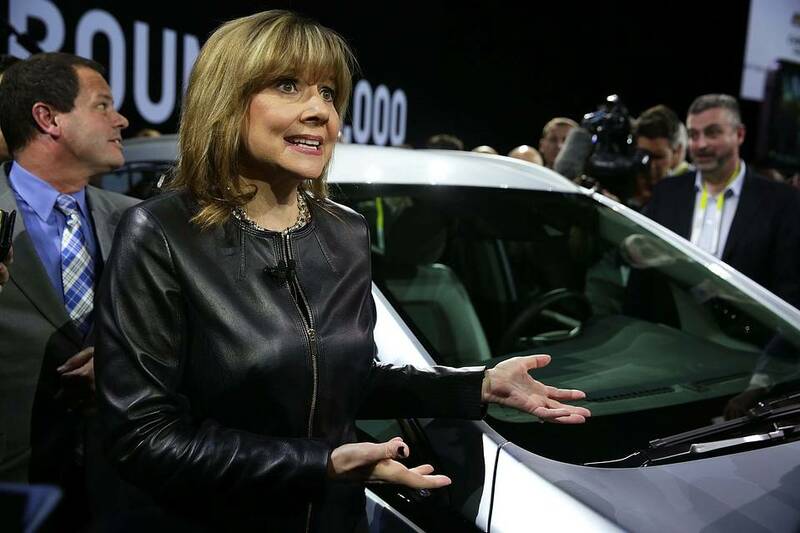 GM CEO Mary Barra played the game during 2014’s congressional Cobalt hearings when she declined to acknowledge the troubled, money-losing small car was built by GM only to meet federal fuel-economy mandates. The auto industry has learned much from Elon Musk, who does not let a month go by without a gee-whiz announcement, if not a real announcement then a fake one about plans for a hyperloop or something. The real reason, however, for GM’s Lyft deal is to use GM’s money to strengthen the No. 2 player in ride sharing, Lyft, in case the No. 1 player, Uber, takes ride-sharing in a direction unfriendly to GM. Uber has been noticeably standoffish from Detroit. It also has $10 billion in investor cash in its pockets. Yet so credulous has been the oohing-and-ahhing in the tech media, some bloggers actually accuse GM of intending to rush robotic vehicles into production to put Lyft’s current drivers out of work. In fact, the deal is reminiscent of the Big Three’s hurry in the late 1970s to buy rental-car agencies (since unloaded). GM, which took stakes in National Car Rental and Avis, sought to assure itself of a dumping ground for the money-losing sedans it was obliged to churn out under fixed-cost labor contracts and government fuel-economy mandates. GM’s Lyft deal has less in common with GM’s big investments in Electronic Data Systems and Hughes Aircraft in the 1980s, which were genuinely aimed at bringing advanced technology into GM. This is a good moment to notice something: Today’s pie-in-the-sky burble about fully autonomous vehicles notwithstanding, robotic technology has actually been remarkably slow to take hold in the auto sector. GM’s Hughes affiliate demonstrated a practical collision-avoidance system for autos more than 20 years ago. Such systems are only reaching consumers now. A big factor—unless economics is a deluded field of study—is the forced diversion of billions in vehicle investment dollars into fuel economy, which Detroit should be loudly criticizing. Take the Obama rules requiring 54.5 mpg (from today’s 24.9) by 2025: These are expected, depending on how much testing fakery and loophole-exploiting the government allows, to cost auto makers $3,000 to $5,000 per car, crowding out lots of features consumers might prefer for their $30,000 sticker price. The industry is so cautious, for political reasons, about admitting this reality that it’s a wonder the SEC doesn’t place its leadership in handcuffs. But if $2 gasoline persists for more than a couple of years, a financial calamity lies ahead for an industry that won’t be able to sell its mandated electric and high-mileage vehicles for anything resembling the cost of building them. In welcoming visitors to this week’s Detroit auto show, the Detroit News warned that “a sudden reversal in the industry’s now-robust health” could be just around the corner. No kidding. International sanctions on Iran were lifted on Saturday. It was determined that Iran had carried out its obligations under its agreement with the United States, Britain, France, Russia, China, and Germany to stop pursuing the development of an atomic bomb. At Geopolitical Futures, we expected sanctions to be lifted and Iran to agree to halt these activities. However, our forecast was not based on the issue of nuclear weapons. Rather, it was based on our model, which indicated there would be cooperation between the US and Iran as a result of converging strategic interests. Nuclear weapons were at one point the main issue when it came to Iran. But by the time an agreement began to emerge, they had become a minor issue. There were much more important problems that needed to be addressed. These problems included the future of the region, the Islamic State, and the common interests of the United States and Iran on both subjects. Let’s begin with the question of Iran and nuclear weapons. Ever since the 1990s, some had argued that Iran was likely to develop nuclear weapons in the near future. By the mid-2000s, the expectation was that it would have these weapons within two years. As each year passed, the due date for when they would be developed moved by another year. The fact that the predictions were constantly wrong didn’t deter the predictors at all. At a certain point, it became necessary to address this question: If Iran was hard at work on nuclear weapons, and was on the verge of building one, why did an underground test never take place? Building a deliverable nuclear weapon is hard and involves much more than simply enriching uranium. Just consider the stresses a completed nuclear weapon, miniaturized to rest on top of a missile, has to undergo. It has to withstand the massive G-forces and vibration of a launch, enter a vacuum where the temperatures vary by hundreds of degrees each second, then re-enter the atmosphere at thousands of degrees, and then explode. Even building a sufficiently ruggedized and miniaturized atomic bomb that can be delivered by aircraft is difficult. But detonating a nuclear device (it’s not yet a weapon) underground as part of a testing process is much easier. The device can be as fragile and sprawling as you want. It isn’t going anywhere. It was my view that Iran might possibly manage a test explosion, but a weaponized system was beyond its capacity. A nuclear test, however, was a risky move. Having a uranium enrichment program, just secret enough that every intelligence agency in the world knew about it, was extremely useful. It allowed others to obsess over Iran’s nuclear power, and that’s exactly what Iran wanted. It had learned the North Korean gambit. The West, and particularly the United States, is obsessed with the mere possibility of nuclear weapons. If you actually build one, the risk is the US may attack you. If you aren’t building one, you will be ignored. But have a nuclear program, without a nuclear bomb, and you will neither be attacked nor ignored. That’s what Iran wanted and what it got. It gained international leverage and attention far beyond what it would have received without a program. And that attention could be used domestically to demonstrate the power of the regime, and regionally to block any extremely aggressive move against Iran, as had happened in Iraq. Bec oming too aggressive toward Iran risked the unknown, since it might have been further along in developing a nuclear weapon than was thought. Therefore, Iran’s nuclear program was less about building a weapon than building uncertainty. This strategy came with a price. The US and European sanctions hurt the Iranian economy substantially. However, the sanctions did not have an immediate impact on Iran’s public pursuit of the bomb. The sanctions began in 2006 and escalated from there. So clearly, as much as the West would like to think that it was the sanction regime that changed Iranian policy, the lapse of a decade would seem to indicate that this was not what broke them. The freezing of assets mattered of course, and the lack of substantial oil revenue and investments also took a toll. But given that the Iranians were not compelled to agree to a settlement when oil was at $100 a barrel and sanctions on oil sales would have had the biggest impact, they were unlikely to feel compelled at $30 a barrel. Sanctions hurt, but not enough to force a change in policy. That’s because sanctions helped the Iranian government politically. Here were six countries, five of them nuclear powers, obsessed with stopping Iran from getting a nuclear weapon. The sanctions were used to demonstrate both the injustice with which the West treated Iran and the fear they had of Iran. This was a heady brew, and the Iranian government used it as more than a counterweight to sanctions. The ability of the Iranians to absorb economic difficulties was substantial. But the pictures of Iranian officials meeting with global powers as equals and challenging their hypocrisy were political gold. And the nuclear program opened the long-term possibility of reaching an agreement that would benefit Iran. Then the region was transformed, and the putative nuclear program decreased in importance to both the United States, in particular, and Iran. This transformation was caused by the emergence of a powerful Sunni movement that was able to take and hold territory in a large region: the Islamic State. The Iranians had experienced the difficulty of dealing with a Sunni-controlled state in the 1980s, when it fought a war with Iraq under Saddam Hussein that cost them about a million casualties. Iran’s worst-case scenario wasn’t war with the United States, but war with a strong Sunni force to their west. The Islamic State was not yet that powerful, but its existence was sufficient to cause Iranian foreign policy to swerve in a new direction. Put differently, a civil war appeared to be breaking out between Sunnis and Shiites, and it was an overwhelming imperative that the Sunni coalition be broken before it could dominate Iraq, and certainly before it could thr eaten Iran. Iran proved incapable of breaking IS by itself. It needed an anti-IS coalition, and the United States had to play some role in that coalition. By this point, nuclear programs were simply irrelevant to the reality of Iran. The United States also shifted its regional strategy. In both Iraq and Afghanistan, the United States discovered a core lesson. It could defeat any conventional or near-conventional enemy army, but it could not occupy either country without fighting an extended war against insurgents and terrorists who were deeply committed to their cause. This was not a new discovery. The Romans, British, and Germans learned this lesson as well. During World War II, in Germany and Japan, the US did succeed in peaceful occupation, not only by waging a military war, but by smashing the society as well. But at that time, it had 10 million men under arms, an economy entirely devoted to the war effort, and powerful allies like Britain and the Soviet Union. Without these things, the only goal that could be achieved was winning hearts and minds and, as it learned in Vietnam, that was easier in theory than practice. Therefore, the United States developed a new strategy. Since it could not control the region through its military, it had no choice but to allow the region to evolve as it would. It was now up to regional powers, who had far more at stake than the United States—and couldn’t withdraw—to manage the situation. The United States would provide air power, intelligence, weapons, and training, but it would not take the primary responsibility on the ground for shaping the situation—because trying consistently led to failure, and continuing to do the same thing hoping for a different outcome is the definition of insanity, to use an appropriate cliché. There were four regional powers who were compelled to be interested in the development of the Islamic State. They were Saudi Arabia, Turkey, Israel, and Iran. Each was threatened by the rise of IS. Each was utterly different from the others and in most cases shared a degree of hostility with each other. Some were close to the United States, and some were hostile. Iran was hostile, yet it was the most concerned of all about IS. The Turks had shown a tendency to try to manage their relations with IS by tacitly ignoring the group. They reportedly allowed the passage of IS operatives and the sale of IS-controlled oil through Turkey and permitted IS militants to use Turkish banks. Tension with IS had grown substantially, but Turkey had not yet committed major forces to the fight against the group. The Saudis, like the Turks, were Sunnis, and while they were concerned about IS, they were far more worried about what Iran might do in the Persian Gulf. The Israelis were worried about everything, but they also understood that a war of attrition against IS was not something they could afford and that an Israeli intervention would only strengthen IS. In a traditional balance of power strategy, the major power maintains common interests with each of the lesser players, while appreciating tension between these nations. That allows the major power to maintain control by being the only one each nation trusts. As the US moved from its strategy of using direct force as its normal mode of operation to using a balance of power to bring regional force to bear, it had to begin the process of balancing regional relationships. Without this, the US would be merely leading a coalition against one of the players. This shift required a closer relationship with Iran. Neither country liked the other, but they had at least some common interests. More important, the US had close relations with the other three regional powers, and this created the appearance of being an anti-Iranian coalition. Particularly as a Sunni rising coalesced around IS, a working relationship with Iran became essential. The nuclear settlement was designed to at least clear the ground for this relationship. Obviously, this meant drawing away from the Saudis, who feared the Iranians, and also allowing friction to build up in the Americans’ relationship with Israel. However, Israel and Saudi Arabia maintained their relationships with the US regardless, as they had no choice. The wildcard was Turkey, which wanted nothing to do with this coalition of the frightened, but has over time moved into an increasingly hostile position toward IS. But it is Iran that has an overriding interest in breaking IS. More than any other issue—the Assad regime, Israel, or nuclear weapons—Iran has an interest in the future of IS. It cannot defeat IS by itself, and it knows that the modest Russian intervention in Syria won’t accomplish the task either. The only power that can both use significant force against IS and create an anti-IS coalition is the US. Saudi Arabia fears Iran, and that is precisely why it must follow the American lead. Israel may not have a military role, but its intelligence and other capabilities can’t be withheld if the US wants it in the mix. And Turkey, as resistant as it is, cannot face a hostile Russia and an indifferent US. It must be brought in as well. Now all of this is far more complex than I have made it, but the bottom line is that the United States and Iran have common interests that override other considerations. It will be argued that any arrangement with Iran is temporary and that in the end the Iranians may turn on the US—or the US may turn on them. This is absolutely true. No arrangement between nations lasts longer than their interests dictate. The US alliance with the Soviet Union crumbled after World War II, while Germany and Japan became allies. The US is now discussing military cooperation with Vietnam. There is no end to the complexity of the relationships between nations. Iran and the United States are not friends. There is no friendship between nations. There are interests—and both share an interest in breaking IS. Even together, they are unable to achieve this task, so others must be compelled to play their part. And when it’s over, different interests will emerge and different constellations of nations will evolve. And so, the great terror of Iranian nukes has been replaced by the great terror of an IS caliphate. Both terrors are legitimate, but passing. For the moment, the US and Iran are afraid of the same thing. This is the finest basis for a shift in relationships between nations. The U.S. stock market is rolling over. In the first week of trading this year, the S&P 500 dropped 6%. It was the index’s worst week since 2011. Now two weeks into the year, the S&P 500 is down 8.0%. It’s the worst start for U.S. stocks since at least 1927, according to Bloomberg Business. Today, U.S. investors get a short “time out.” U.S. stock markets are closed because of Martin Luther King, Jr. Day. On Friday, the Shanghai Composite Index dropped 3.6%. Chinese stocks are now down 18% on the year. The Euro Stoxx 600, which tracks 600 of Europe’s biggest stocks, dropped 2.8% on Friday. The Stoxx 600 is now down 20.6% since setting a record high last April. As of Friday, European stocks are “officially” in a bear market, which happens when a price falls 20% from a prior high. … [M]ore than $5 trillion has been erased from global equities in the most dismal start to any year on record. At Friday’s close, more than half of the 45 markets tracked by Bloomberg had entered a bear market decline of at least 20 percent from their recent peaks. Canadian stocks entered a bear market two weeks ago. Chinese stocks have been in a bear market since June. Brazilian stocks have been in a bear market since August. And Japanese stocks are on the verge of a bear market. The Japanese Nikkei 225 index is down 19.7% from its high last June. The index is down 12% from the all-time high it hit last May. From that perspective, the U.S. stock market looks OK compared to other markets. However, the S&P 500 doesn’t tell the whole story of U.S. stocks. Although it’s the most widely watched index on the planet, the S&P 500 only tracks 500 large U.S. stocks. More than 3,700 stocks trade on the New York Stock Exchange (NYSE). The NYSE has fallen 17.3% from its all-time high set in May 2015. On Friday, an incredible 702 stocks on the NYSE hit 52-week lows. Regular readers know small stocks have done much worse than large stocks lately. The Russell 2000, an index that tracks 2,000 small U.S. stocks, is in a bear market. It has dropped 22% since June 2015, to its lowest level in more than two years. Although the S&P index is down “only” 12%, more than half of the stocks included in the index are in bear markets. On average, S&P 500 stocks have fallen 24% from recent highs. How is this possible? The S&P 500 is weighted by company size…larger stocks impact its performance more than smaller stocks. For example, Google (GOOG), the second-largest S&P 500 stock, makes up 2.52% of the index. McDonald’s (MCD), the 36th largest stock, only makes up 0.6%. Last year, the S&P 500 fell 0.7%. It was the index’s worst year since 2008. However, it would have been much worse if the FANG stocks – Facebook (FB), Amazon (AMZN), Netflix (NFLX), and Google – hadn’t done so well. On average, the FANG stocks climbed 83% last year. These large companies, along with a few others, have been propping up the S&P 500. So far this year, all four FANG stocks have dropped more than the S&P 500. Amazon is down 15.6%. Facebook is down 9.3%. Netflix is down 9.0%. And Google is down 8.5%. In general, it’s a bearish sign when stocks that had been leading the bull market start to roll over. The index’s PE ratio is currently 19.81. That’s 27% higher than the S&P’s average PE since 1917 (a higher PE ratio means a stock or index is more expensive). That’s 31 months longer than the average bull market since World War II. U.S. stocks have soared during this period. The S&P 500 has gained 178% since March 2009. Since 1932, the average gain for the S&P during a bull market is 136%. Old age and steep valuations aren’t enough to end a bull market. But they are good reasons to invest with caution. We recommend holding a significant amount of cash right now. This could help you avoid major losses if U.S. stocks continue to fall. At some point, U.S. stocks will be cheap again. When that happens, you’ll want to have cash on hand to buy shares of world-class companies at fire-sale prices. Dispatch readers know gold is financial wealth insurance. For thousands of years, it’s preserved wealth through every kind of financial disaster imaginable. The price of gold rose 1.0% during the stock market sell-off on Friday. Gold is now up 2.6% on the year. It’s trading near a two-month high. If you’re worried U.S. stocks will keep falling, we recommend owning physical gold. As a safe haven asset, gold prices typically rise when stock prices fall. We also recommend watching this free video. It’s a short presentation to teach Casey readers simple strategies to protect their money in a bear market. I see the coming fall of the U.S. stock market as one of the surest bets in the world today. Louis is shorting U.S. stocks (betting they will fall). Earlier this month, Louis told his readers to buy the Proshares Short S&P 500 ETF (SH). This fund goes up when the S&P 500 goes down. In less than two weeks, Louis’ readers are already up 8.3% on the trade. And the fund is still a BUY, even after its initial jump. You can learn more about this trade, and other ways Louis is hedging his portfolio, by signing up for a risk-free trial to Casey Resource Investor. Click here to learn more. Today’s chart shows the performance of MSCI Emerging Markets Index, which tracks stocks in 23 emerging markets. Last year, the index fell 17% for its worst year since 2011. Over the past two weeks, the index has dropped another 11%. It’s now at its lowest level since 2009. According to Thomson Reuters, Hungary is the only emerging market that’s up this year. Many emerging market stocks are getting cheap. Yesterday, Bloomberg Business reported that emerging market stocks are trading at a 29% discount to stocks in developed nations. Eventually, we’ll get an incredible opportunity to buy emerging market stocks at bargain prices. But for now, we recommend staying away. As you can see from the chart, emerging market stocks are in a sharp downtrend. They’re likely to fall further before bottoming out. We’ll let you know when emerging market stocks begin to carve out a bottom. It must be China. Or the weather, which is usually either too cold or to warm - somehow the weather is just never right for economic growth. Surely, it cannot be another Fed policy-induced boom that is on the verge of going bust? Sorry, we completely forgot - the Fed is never at fault when the economy suffers a boom-bust cycle. That only happens because we have "too few regulations" (that's what Mr. Bernanke said after the 2008 bust - no kidding). No matter what economic data releases one looks at lately, one seems more horrendous than the next. This is apart from payrolls of course, which are not only a lagging indicator, but are apparently a number that is occasionally made up out of whole cloth - such as in December, when 281,000 of the reported 292,000 in non-farm payroll gains were the result of "seasonal adjustment", which is bureaucrat-speak for "didn't actually happen". 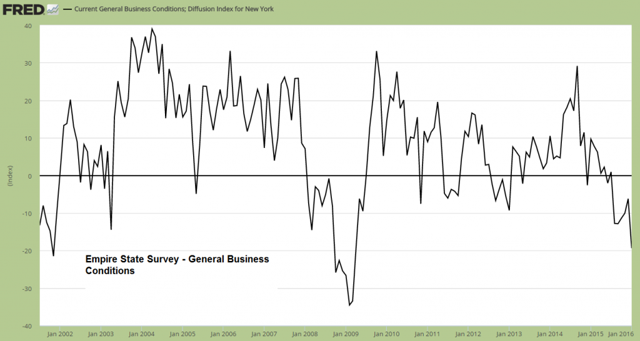 Empire State Survey, general business conditions index. Such readings are usually not seen during economic expansions. "The Econoday Consensus estimate was for a slight improvement to -4 from a November reading of -4.59. The actual result was -19.37 with the lowest economic estimate -7.50." Our friend Micheal Pollaro has provided us with several charts, including the following comparison chart, which shows the Empire State survey's new orders index for January, as well as the new orders index of the National ISM and the average of the new order indexes of the Fed district surveys as of December. 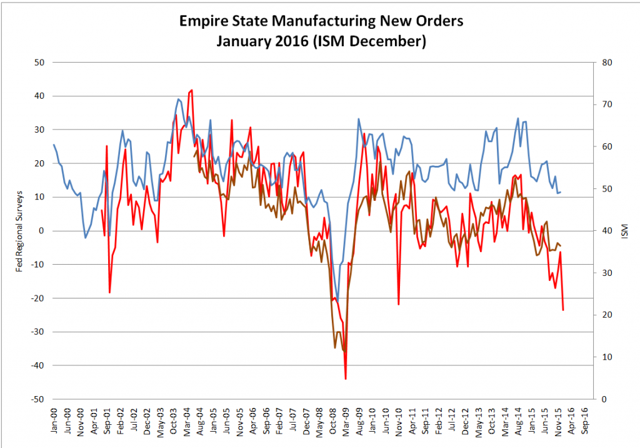 Not only are new orders one of the most important components of such surveys, as they lead future manufacturing activity, but in recent months the Empire State new orders index has begun to lead other survey data. If it continues to work as a leading indicator, one should expect more negative data points to be released in the near future. New order indexes: Empire State (red line, for January), average of all district surveys (brown line, as of December) and ISM (blue line, as of December, rhs). Admittedly, this is an especially volatile regional survey, so it is probably not useful as decisive evidence for a broader economic downturn, but every other data points released today proved to be a disappointment as well. The industrial production index has also continued its decline in December. Industrial production declines further. Keep in mind that NBER is backdating the beginning of recessions once they are six months old or older. This means that a recession is never officially recognized when it actually begins. In other words, a recession may have begun already; we will only know for sure a few months down the road. It is quite funny that the failure to forecast the decline in IP was once again blamed on the weather. The credibility of that excuse is really beginning to wear thin - are economists as a group unaware of the weather? What was it about the weather that hindered industrial production this time? Apparently, it was too warm. One might be tempted to conclude that it is the mere fact that weather as such exists that is the problem here, but the reality is of course that forecasts of specific economic data down to 10ths of percentage points are essentially a waste of time. One might as well toss a coin. 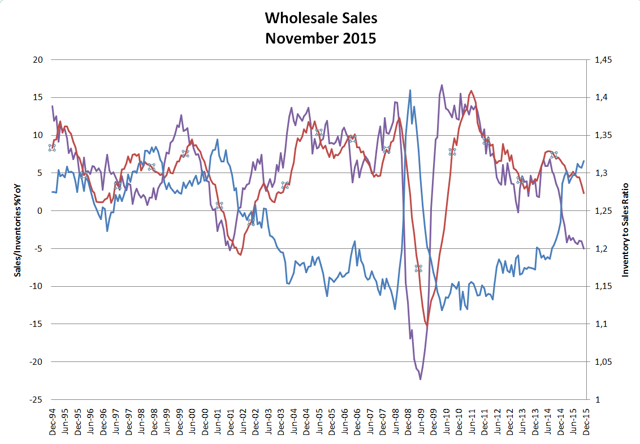 But surely December retail sales would come in at a reasonably good level? No luck on that score either, although this weak report (down 0.1%) was actually the best of the day. This time expectations were only slightly undercut, but there were large declines in a broad range of sub-sectors, all of which normally tend to do well in the Christmas season. Lastly, the Census Bureau reported business sales and inventories for November, with the slide in sales continuing - inventories declined by 0.2% on month-on-month, but were still up 1.6% from a year ago. 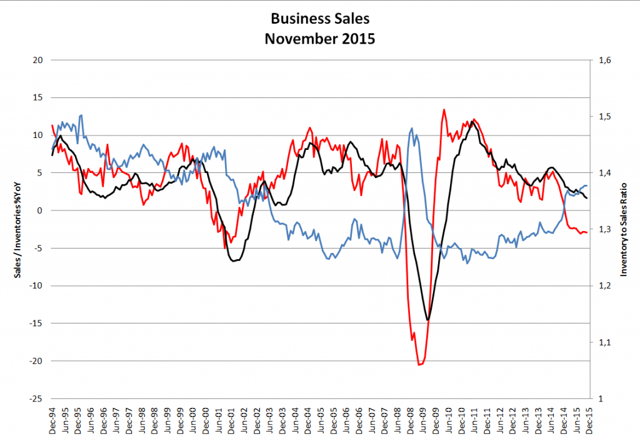 Sales declined at a similar pace month-on-month, but were down 2.8% from a year ago. As a result, the inventory-to-sales ratio remained stuck at its recent interim high - which is still the highest level since mid 2009. Mid 2009 wasn't a particularly happy time for the economy. Business sales (red line) and inventories (black line) and the inventory-to-sales ratio (blue line, rhs). Wholesalers: y/y change rate in sales (purple line), inventories (red line) and the inventory-to-sales ratio (blue line, rhs). 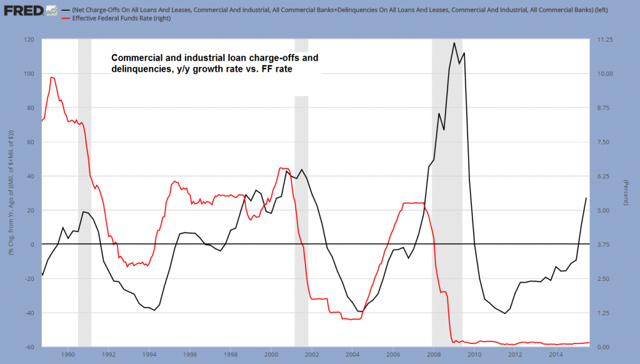 The sum of C&I loan charge-off and delinquencies vs. the FF rate. 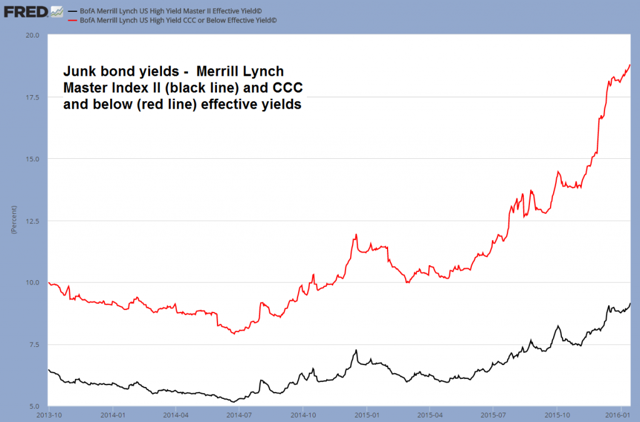 Junk bond yields keep surging. Lastly, our coincident boom-bust indicator, the ratio of capital equipment to consumer goods production, remains at quite an elevated level. This suggests that if a bust has indeed begun, it is only in its beginning stages. 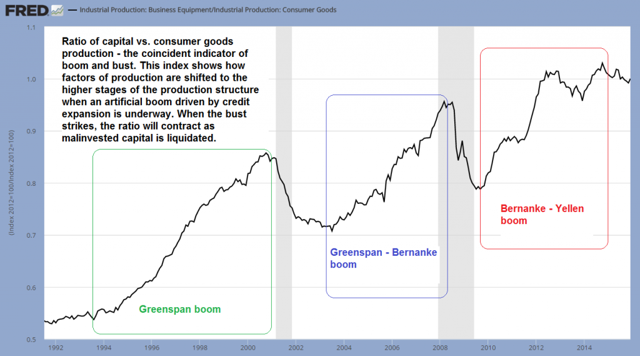 Three booms induced by loose monetary policy, as seen in the ratio between capital and consumer goods production. The ratio of capital equipment to consumer goods production gives us a rough idea toward which stages of the production structure the bulk of investment is flowing. Just as capital theory suggests, during times when interest rates are artificially suppressed and the money and credit supply are expanding, the higher stages of production (capital goods producing industries) attract a greater level of investment and display more activity relative to the lower stages (consumer goods). However, this can never work out in the long run, as production is ultimately not funded by "money", but by real capital, i.e., by real savings. It is impossible to print the economy to prosperity and these artificial booms are therefore never sustainable. The denouement of the boom can be delayed by keeping monetary policy loose for longer, but such delaying tactics will as a rule merely worsen capital consumption and hence the subsequent bust. The chart above is telling us that more society-wide impoverishment definitely awaits. Everything continues to suggest that the economic recovery is in the process of screeching to halt. The recovery was already the weakest of the post WW2 era to begin with. Only one datum still gives us pause, and that is the rate of growth of the broad true money supply TMS-2, which has seen a rebound to approximately 8% year-on-year in November. On the other hand, the annual growth rate of narrow money M1 has reached a new low for the move of 4.65% in mid-December, compared to a peak reading of approx. 24.6% attained in October of 2011. While this volatile series has rebounded sharply between mid December and early January (to 9.5%), the effects of changes tend to arrive with a considerable lag. We continue to suspect that it will lead the broader measure TMS-2 lower as well. Lastly, the stock market, oversold as it already was, proved unable to withstand today's onslaught of data and proceeded to fall out of bed completely. At one point the DJIA was down more than 500 points. By the close it had recovered to a loss of 390 points, which is still quite hefty. As we noted yesterday in this context: "[An] oversold market can easily become more oversold when it keeps being inundated with evidence that economic conditions are not what they were thought to be." 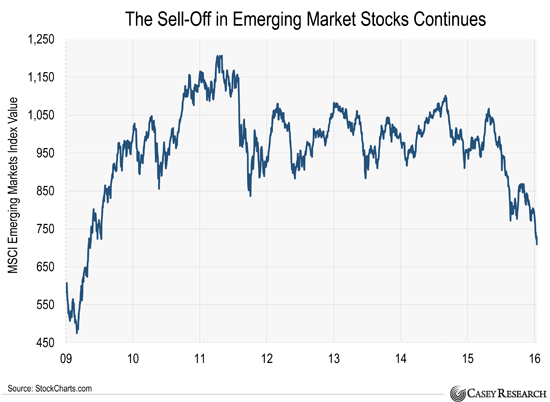 The S&P 500 Index bounces after briefly undercutting the August 2015 low by a mere seven points. This level seems ideally suited for a rebound to begin, but at the same time, it remains uncomfortably close. Based on technical grounds, we still believe that the market is likely close to a short-term rebound, but keep our recent warning in mind: Sharp declines during usually seasonally strong periods are a typical bear market characteristic. In fact, as Jason Goepfert reports, the recent combination of market moves has only been seen in the vicinity of a handful of major historic market tops. Note that Mr. Goepfert's observations are independent from what we said about seasonal patterns. If we add the occurrences of past warning signals given by unusual seasonal cycle inversions to his list, we find a few overlaps, as well as additional examples (namely 1962, 1973, 2001, 2007, 2008 and Tokyo 1990 - there may be a few more examples for this, but these are probably the most prominent ones). In connection with the economy, the relevance of this consists of the fact that a putative bear market ("officially" the market is merely in a strong correction so far) would almost certainly go hand in hand with a recession.